One of the many mistakes individuals and advisors make when investing is looking at individual securities or asset classes in isolation. Is that a good large-cap value fund, or short-term bond fund? You simply do not know by looking at holdings by themselves, any more than you can assess the ingredients in a cake by sampling them individually. A well-balanced portfolio, one that holds large and small stocks spread across growth and value companies, and is diversified internationally, should have higher returns and less risk than the average of the individual holdings. Diluting all-stock allocations with relatively safe short-term bonds should dampen volatility while still achieving reasonable returns. Certain asset classes, like short-term bonds, that do not appear worthwhile by themselves (due to low returns), can prove valuable in a portfolio context because they reliably reduce short-term portfolio price swings with minimal allocations, leaving as much as possible devoted to stocks in pursuit of higher and more tax-efficient returns. We now have 46 years of data on indexes that cover stock and bond asset classes globally. Comparing various asset allocations from a 100% "Equity" allocation to a 100% short-term "Fixed" allocation, as well as 80/20, 60/40, 40/60, and 20/80 combinations of both, we see that globally diversified portfolios have generated much higher returns with less risk than conventional, stand-alone market indexes. The chart above shows a risk/return plot of each index asset allocation compiled by Dimensional (DFA), as well as the S&P 500 Index, the international MSCI World ex USA Index, and the Barclays US Market Bond Index. The S&P 500 Index, which has been on a tear in recent years, falls far short of a diversified stock portfolio. 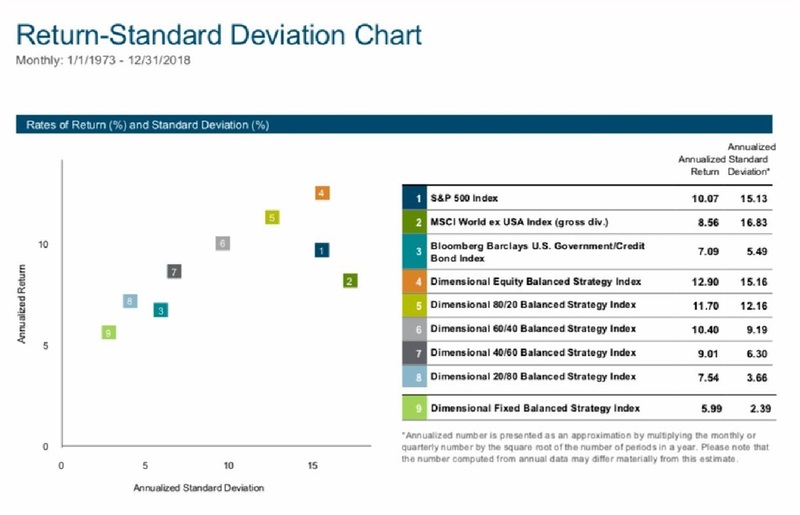 The DFA Equity Balanced Strategy Index has returned +2.8% per year more with identical standard deviation (risk). Even diversified allocations with short-term bonds outperformed the S&P 500 -- the DFA 80/20 Balanced Strategy Index had 1.6% higher annual returns with 20% less standard deviation, the DFA 60/40 Balanced Strategy Index, with just 60% in stocks and 40% in bonds, had 0.3% higher annual returns than the S&P 500 with 40% less volatility! The international MSCI World ex USA Index has had lower returns and higher risk than even the S&P 500, yet globally diversified portfolios still benefited from overseas exposure. The DFA 40/60 Balanced Strategy Index, with a considerable 60% in short-term bonds, managed to outperform the MSCI International Index by 0.4% per year despite 60% less volatility! The Barclays US Government/Credit Bond Index, which covers the US bond market, had relatively low returns and risk. But slightly higher returns, +7.5% versus +7.1%, could have been achieved with an allocation that had 20% in stocks and 80% in shorter and higher-quality bonds, as represented by the DFA 20/80 Balanced Strategy Index. The 20/80 diversified portfolio did so with over 30% less volatility than the US Bond Market Index that includes lower quality and longer-term securities. The longer-term bonds held in the US Bond Index are so volatile, in fact, that it had similar volatility to the DFA 40/60 Balanced Strategy Index with a full 40% in stocks (but 60% in less volatile bonds)! The difference being that the 40/60 diversified portfolio had almost 2% per year higher returns! So what is the right portfolio mix for an investor after you decide to diversify broadly? That depends on your long-term goals and tolerance for portfolio fluctuations and temporary losses. An experienced advisor can help you by spending the time necessary to understand your individual situation and align your wealth with a portfolio best suited for what you are trying to accomplish. No matter which speed you decide to go, it's clear that it should be viewed as a whole instead of looking at and evaluating the individual pieces. When it comes to a successful investment experience, it's all about the portfolio. Source of data: DFA Returns Web. Details of DFA Balanced Strategy Indexes available upon request.